Problem viewing/PDA users, click here. On Capitol Hill yesterday, the PBGC Pilots Equitable Treatment Act (H.R. 1867) was reintroduced in the 112th Congress. ALPA has long supported this legislation and issued the following statement upon the bill’s introduction, “The Air Line Pilots Association, Int’l, applauds the reintroduction of this much-needed pension reform legislation to promote fairness for airline pilots whose pension plans were terminated or frozen as a result of their airline declaring bankruptcy,” said Capt. Lee Moak, ALPA’s president. ALPA will work with the bill sponsors to advocate for the legislation in the House and Senate. ALPA’s Executive Board ratified a merger with the Canadian North Pilots Association (CNPA). The 106 flight crewmembers of Canadian North overwhelmingly voted in support of the merge which became effective on May 1. “We’re looking forward to working with ALPA and contributing to its success, as well as to promoting the interests and needs of our Canadian North Flight Crewmembers,” said Capt. Chris Kampen, Canadian North’s master executive chairman. Canadian North (CNP) is the 9th pilot group in Canada to join ALPA, further strengthening ALPA’s position as the preeminent voice of commercial pilots in North America. In addition to the U.S. pilot groups, Canadian North joins Canadian pilot groups Air Transat, Bearskin Airline, Calm Air, CanJet, First Air, Jazz, Kelowna Flightcraft, and Wasaya. 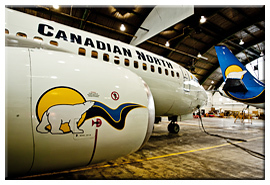 Canadian North is a major provider of scheduled passenger and cargo services from Edmonton and Ottawa to points throughout the Northwest Territories and Nunavut. They offer non-scheduled charter flights throughout Canada and to the U.S. Canadian North is headquartered in Yellowknife, Northwest Territories, Canada. The airline operates a fleet of B737-300s, B737-200s, and Dash 8-100s. ALPA president Captain Lee Moak this week contacted U.S. ALPA pilots* via e-mail to urge them to contact their federal legislators about the Association’s three top priorities in the pending FAA Reauthorization legislation—the Shuster amendment, air carriage of lithium batteries, and unmanned aircraft systems—through the ongoing grassroots Calls to Action. While the numbers of participants are rising, to make an impact many more ALPA members need to let their elected officials know they are opposed to the ill-conceived content of these provisions. Moak also reminded the pilots that a strong political action committee is critically important to ALPA’s efforts to influence the outcome of this legislation. He called on all U.S. ALPA pilots to make a voluntary ALPA-PAC donation of any amount at this time to assist in this legislative effort. Moak’s e-mail included direct links to participate in the Calls to Action as well as to make an online credit card contribution to the PAC. If you received this e-mail and have not yet responded, please do so today! Or click here to send your messages to your legislators. Click here to make a secure ALPA-PAC donation via credit card. *Moak’s e-mail went to U.S. ALPA members who have not yet contributed to ALPA-PAC in 2011. Alaska Airlines last week began distributing iPads to its pilots. After a trial period and FAA approval, these iPads could replace the traditional flights bags, manuals, and Jeppesen charts if the company can demonstrate to the FAA that the pilot group is proficient with the device. Until then, during the trial period pilots will carry both the iPad and their flight bags. The Company’s proposal to introduce iPads raised a variety of concerns with the Alaska pilot group. Those concerns were addressed in a manner that protected the pilots. Once a pilot is issued the iPad, he or she is expected to begin using it in conjunction with paper manuals and charts. So far, more than half of Alaska’s pilots have been issued iPads. The ALPA Critical Incident Response Program (CIRP) Committee, led by Chair Louise Cullinan (MAG), held its annual meeting in Denver last month. The 43 volunteers in attendance represented 13 ALPA carriers and 8 other domestic and non-U.S. carriers, plus the National Air Traffic Controllers Association. The committee would like to both acknowledge and thank the Continental, Mesa, and United MECs for providing financial support that helped defray the cost of this event. At the meeting, Capt. Bill Morin (ALA-Ret.) 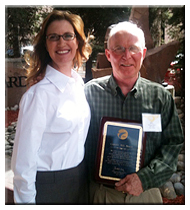 received a plaque in appreciation and recognition of his work to advance CIRP over the past two decades. Morin was instrumental in the creation of ALPA’s CIRP Committee in 1994. Even in retirement, he continues to be active in CIRP, volunteering countless hours to both ALPA Int’l and the Alaska CIRP Committee. ALPA established CIRP to assist those who have experienced an incident, accident, or other traumatic event in their lives. CIRP-trained pilots and spouses are used as peers to lessen the stress reactions that incidents or accidents may have on pilots, accident investigators, and their families. Most ALPA MECs have adopted the program, which is credited with helping many pilots return to the cockpit after an incident or accident. In addition, a global network of airline CIRP programs continues to expand with ALPA’s help and guidance. Through this network, an ALPA pilot is better assured of getting the CIRP assistance needed, no matter where he or she happens to be. CIRP is part of ALPA’s Pilot Assistance efforts, in conjunction with HIMS, Professional Standards, Aeromedical, and Canadian Pilot Assistance. Spring 2011 will undoubtedly go down in the record books for the number of thunderstorms and devastating tornados experienced across the United States. More than 300 people were killed by the wave of violent weather that swept across the South just last week. If you are an ALPA member affected by a widespread disaster and need help, be sure you reach out to the ALPA Emergency Relief Fund (AERF) for assistance. Log on to www.alpa.org/relief, and click on the “Help” button. Review the eligibility requirements and submit an application, following the instructions provided. You can also contact AERF by sending an e-mail message to relief@alpa.org or by calling 1-888-FLY-ALPA (select 3 for Membership Services). You’ll need to provide your name, airline, membership number, and contact information. To make a U.S. tax-deductible donation, please log on to the ALPA Emergency Relief Fund Web page, or send a check to ALPA Emergency Relief Fund/535 Herndon Parkway/P.O. Box 1169/Herndon, VA 20172-1169. Remember that AERF is only as valuable as we make it, so please donate generously today. • According to preliminary data from the U.S. Department of Transportation, the overall workforce at U.S. airlines grew by 1.7 percent in March, as compared to March 2010. Most notably, American Eagle’s employee population grew by 6.8 percent, followed by Delta with a 5.2 percent increase. • The U.S Department of Transportation recently reported that March was the fourth month out of the last six that U.S. airlines reported no tarmac delays longer than three hours. In March 2010, airlines reported 25 tarmac delays of more than three hours. • A passenger was wrestled to the floor on a Continental flight from Houston to Chicago last Sunday after he tried to open the plane’s door while in flight. Witnesses said the 34-year-old man ran toward the main boarding door of the Boeing 737, saying that he had to get off the plane. He was subdued by passengers and crew and the plane was diverted to St. Louis, where he was handed over to law enforcement officials. Also on Sunday, Rageh Ahmed Mohammed Al-Murisi, a Yemeni citizen, attempted to force his way into the cockpit during an American Airlines flight from Chicago to San Francisco. He, too, was wrestled to the ground and turned over to law enforcement officers. Do you know about the Air Line Pilots Association Federal Credit Union? Established in 1947, the ALPA Federal Credit Union is a not-for-profit, member-owned financial institution serving airline pilots and their immediate family members. The Credit Union offers credit cards, loans, and a variety of accounts to suit your many banking needs. Want more information? Go to www.alpafcu.org or call the Credit Union at 630-789-2575 (toll-free at 800-747-2575). Find out about the advantages of banking with the ALPA Federal Credit Union. Questions or comments on this FastRead? Give us your feedback at communications@alpa.org. If you have moved or changed your ISP or e-mail address, please update your ALPA records. If you don’t, you will no longer receive the ALPA FastRead and other e-mail bulletins and notices, and once your postal forwarding order expires, you’ll no longer receive the magazine and other ALPA mail. You can do it yourself by going to www.alpa.org and logging in. Go to “My ALPA” in the menu at the top of the page, and from there, you’ll be instructed how to make the necessary changes. If you don’t have access to the members-only section of www.alpa.org, you can e-mail your requests by sending them to membership@alpa.org. Be sure to include your member number or enough other information so that we can identify you in the membership database, and tell us what information needs to be updated. Please note that it is not sufficient just to notify your LEC or MEC of these changes—you should register them with the ALPA Membership Department in Herndon. Can’t remember your member number or how to log in? Need information about your ALPA insurance programs? These and other questions about ALPA services can be answered by contacting membership@alpa.org.